Team PSG.LGD had a second chance to square off against OG in the final battle for Dota 2’s Aegis of Champions, but in the end, it was the scrappy Team OG who walked away from Vancouver’s Rogers Arena holding both the Aegis and The International 2018’s $11 million prize. PSG.LGD lost their semi-final series to OG and wound up in the lower bracket Friday. 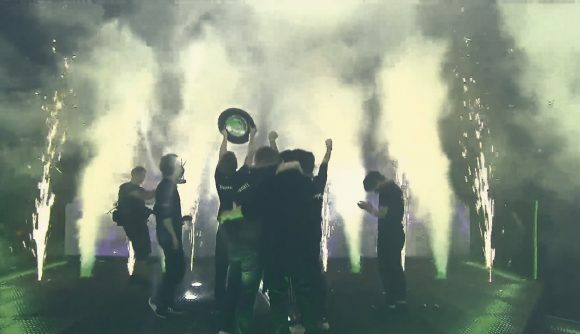 But Saturday, they soundly defeated Evil Geniuses 2-0 to earn their spot in the championship round, once again squaring off against OG, the underdog team who’d faced multiple roster changes and an improbable trip to the International from the open qualifiers. After an initial OG win, PSG.LGD drafted smartly to respond to OG’s reliance on map-wide mobility buffs, and PSG completely shut down Topias “Topson” Taavitsainen’s Invoker in Game 2, leaving him with zero kills and 12 deaths in the round. Game 3 was another resounding win for PSG.LGD built on the strength of their Brewmaster and Alchemist combo, and after the Game 4 draft, it looked as though PSG was poised for the win. But OG held on and clawed their way back up, fighting their way to a surprise Game 4 win and forcing the rare grand finals Game 5. Again, OG found themselves outdrafted, but PSG.LGD played conservatively, and when OG saw a sweet spot, they pounced together, managing crucial coordinated kills and storming the Ancient, ultimately winning Game 5 and the International’s $11 million purse. As the runners-up, China-based PSG.LGD win the second place prize of just over $4 million.